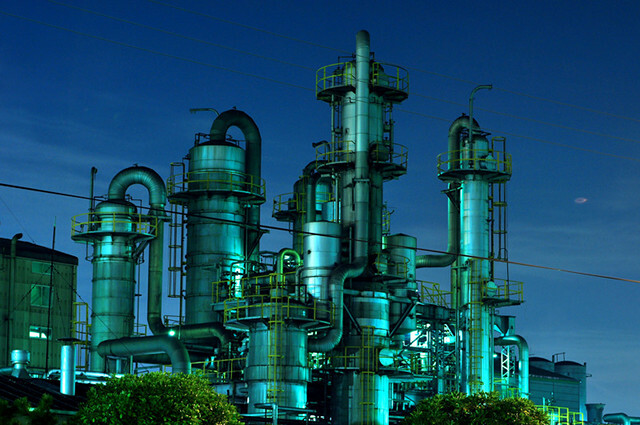 These gleaming pipes are on a factory in Kawasaki. Do you think that ‘industrial’ isn’t the most appropriate word for promoting a tourist destination? 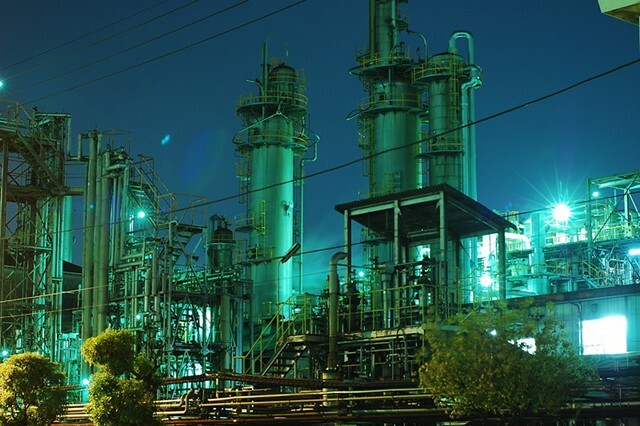 Are ammonia plants and oil refineries places you’d rather avoid on your holidays? Japan’s urbanites used to go out of their way to avoid the country’s sprawling petrochemical zones, but now they’ve been reinvented as tourist attractions due to their unique, otherworldly beauty. 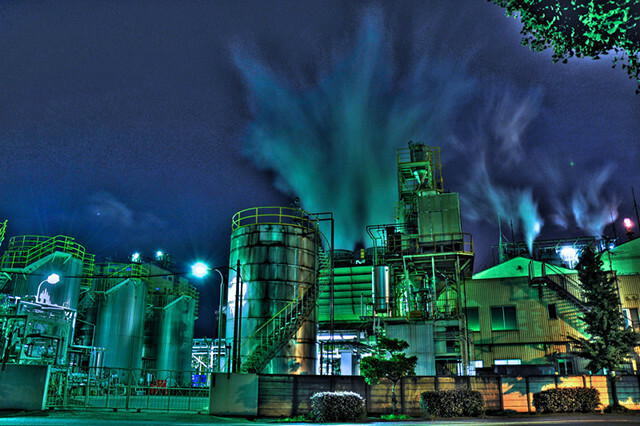 The ‘kojo yakei’ (meaning ‘factory night view’) phenomenon kicked off a few years ago, and now tourists are signing up en masse for bus trips and boat cruises of Japan’s industrial complexes, so they can admire the aesthetics of these chemical bakeries. This factory is almost like a giant engine with the cover taken off. 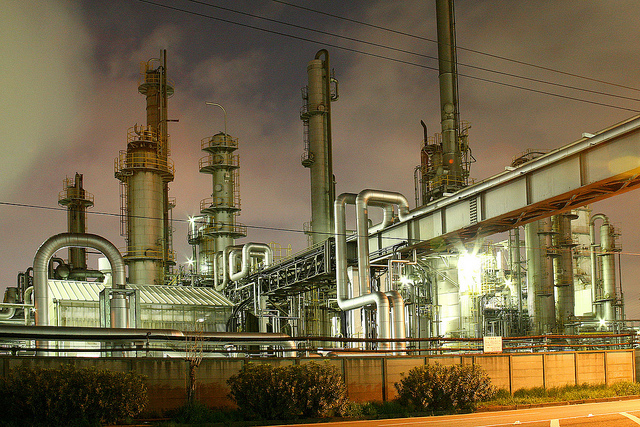 Whoever designs chemical plants must regard walls and roofs as superfluous. Most visitors go after dark, as that is when the spectacle is at its best. 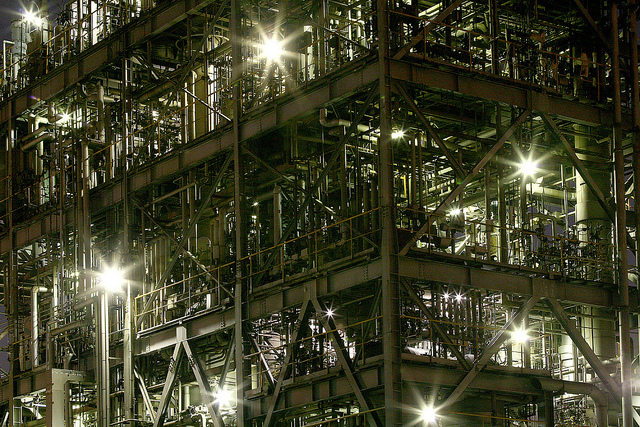 Huge industrial zones in the towns around Tokyo and throughout Japan are crammed with towering steel castles. Light reflects off gleaming metallic labyrinths, and flames reach skywards like the tendrils of caged demons struggling for freedom. 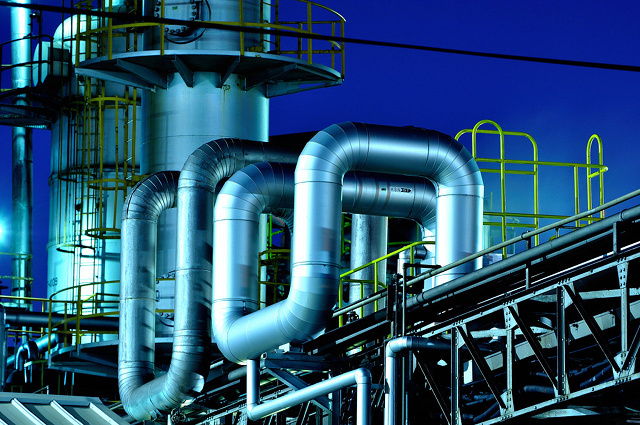 Day and night, gases and liquids pass through a tangle of silver pipework, escaping here and there as clouds of steam that billow skywards. 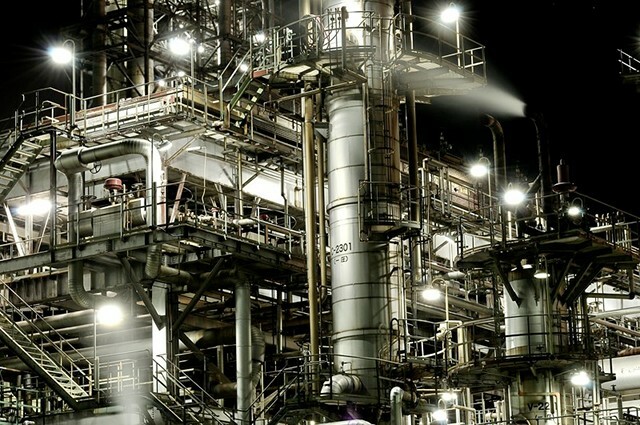 These sleepless furnaces never stop, standing tall like giants as they work their fiery magic to churn out petrol, steel, gas, electricity, and all the exotic substances that lie at the foundation of twenty-first century living. This plant is a true giant, but its size only adds to its magnificence, especially when you see it first-hand and not from a photo. If you go on a kojo yakei tour, you might expect most of your fellow passengers to be nerdy engineers, but the reality couldn’t be more different. The dominant demographic is often young couples out on dates. They are joined by men and women of all ages, but young urbanites seem to be in the majority. They haven’t come to wonder at the marvellous efficiency of modern industry, or to educate themselves about the their country’s industrial base. Kojo yakei is all about aesthetics – admiring industry for how it looks – as unintended works of public art. No one really cares about what the plants make or how they work – you don’t need to know any of that in order to be seduced by their functional allure. Kojo yakei places us in an totally alien environment, where we experience sights, sounds, and even smells, that are a world away from ordinary life, but also just a short distance from the centres of Japan’s big cities. Those big towers standing side-by-side give me the impression of power and a unity of purpose. The trend all began in 2007 when a book called Kojo Moe, meaning ‘factory passion’ was published. 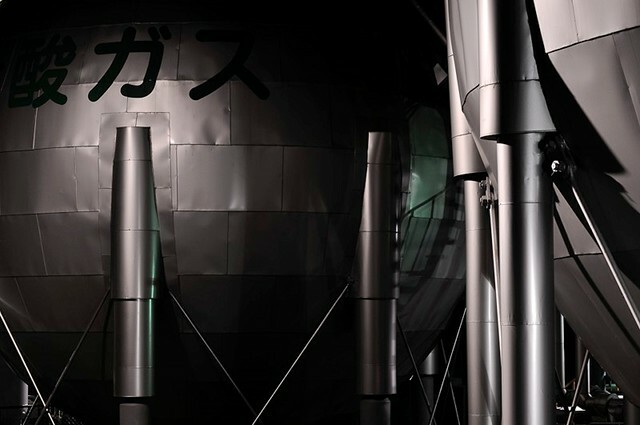 It featured photos of Japan’s factories, and gave details of the best places to go to see them. One of the book’s authors, Ken Oyama, has generously allowed us to use some of his photos on this page – click on the images to see which ones are his. 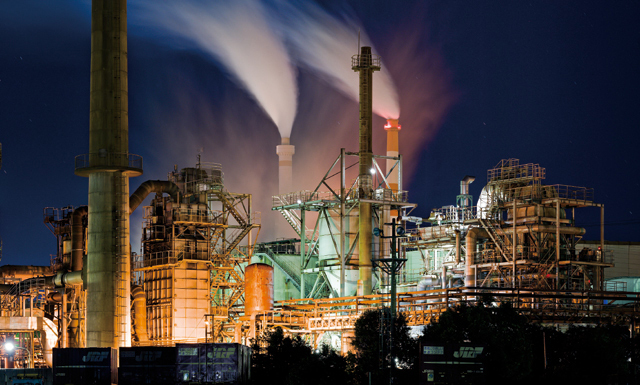 Kojo Moe rapidly became a bestseller, leading its readers to look at industrial buildings, which had previously been seen only as polluting eyesores, as objects of magnificent grandeur. 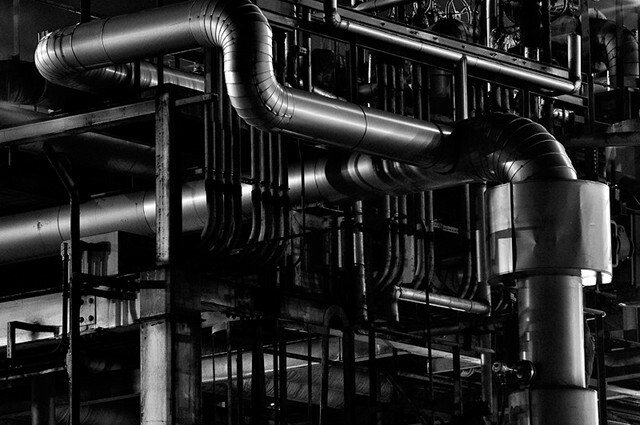 Now there’s a profusion of factory photo books, as many other photographers have jumped on the bandwagon and headed out to the industrial zones. There’s even an on-line kojo moe community with over 26,000 members. Below we give details of how you can experience kojo yakei yourself. 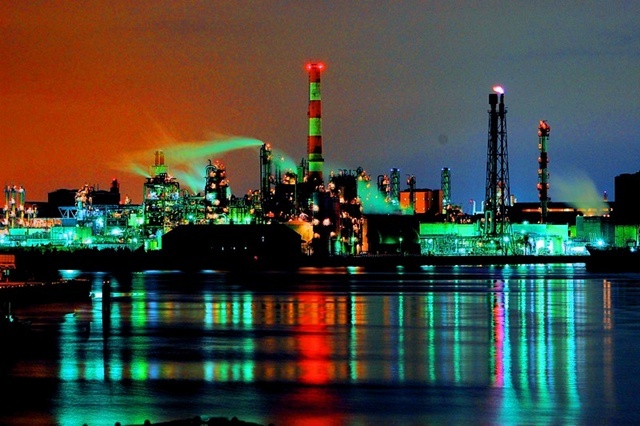 The lights of this chemical plant create a mystical atmosphere. 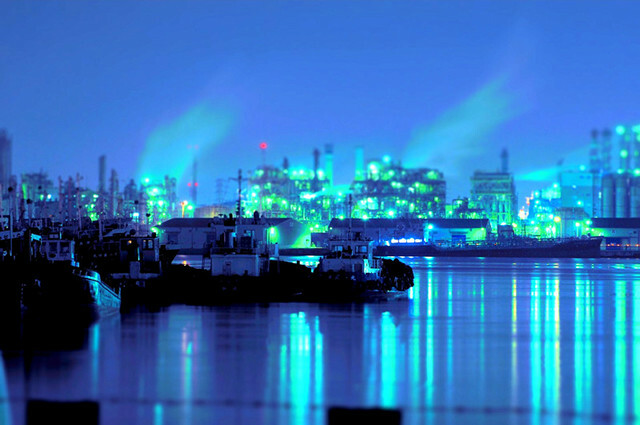 On the Yokohama Factory Night Scenery Cruise you follow a course along the shoreline of Tokyo Bay on a small boat that carries up to 25 people, passing major industrial zones in Yokohama and the neighbouring city of Kawasaki. You enter a system of canals that give the giant plants direct access to the sea, so that at some points you’re surrounded by industrial activity on all sides. The cruise takes around ninety minutes, and runs year-round, but it must be booked in advance. It costs ¥3,500 and leaves from Yokohama at 7:00pm every Friday to Sunday, and at 8:00pm on Thursdays. To reserve your place call 045-263-9360 as soon as possible, as it often sells out, and be sure to confirm the departure point and time as they are subject to variation. Cruises usually leave from Yokohama Paradise, which is next to the Yokohama Grand Intercontinental Hotel, just five minutes walk from Minatomirai Station. To get there from Tokyo, first travel to Yokohama Station. Either take the Tokaido Line from Tokyo Station (26 minutes, ¥450) or the Shonan Shinjuku Line from Shinjuku Station (33 minutes, ¥540). From Yokohama Station, Minatomirai Station is just three minutes away on the Minatomirai Line (¥180). Light and steam combine to create a dreamy scene. Yokohama Cruise offer the Factory Night View Jungle Cruise, covering approximately the same route, for ¥4,500. It also takes an hour and a half, but their boat is bigger, accommodating ninety passengers. It runs on Saturdays and Sundays, with the departure time depending on the season, ranging from 4:30pm in December to 7:00pm in June. Again you must book a place in advance, this time by calling 045-290-8377, or by using the online booking system. The cruises depart from the Aka-renga Pier in Yokohama. To get there, travel to Yokohama Station as described above, then take the Minatomirai Line to Bashamichi Station (five minutes, ¥180). If both of these cruises are booked up, several other tours covering similar routes are listed on this website, but if you don’t read Japanese you’ll probably have to get someone to help you make sense of it. 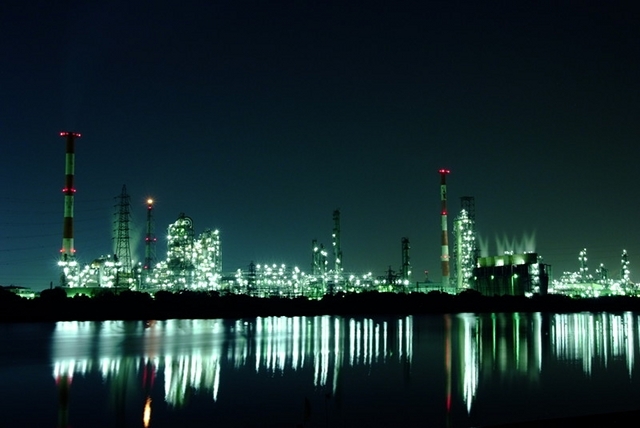 On a Kawasaki Factory Night View Tour you get to visit carefully selected viewing spots by bus, including some areas that are not normally open to the public. These include the Nemoto Shipyard, from where you can get an excellent view of the surrounding factories. The tour also includes a stop for a ‘Factory Night View Curry’ at the Sky Restaurant Frontier, so ensuring that the tour provides stimulation for all of your senses. Tours run on the first and third Friday of every month, and depart from Kawasaki Station. The cost is ¥4,300, and bookings can be made through Tabi Plus One online, or by phone on 03-6436-0395. You can also make enquiries by email to 28syogyo@city.kawasaki.jp. The departure time varies from 5:00pm to 6:30pm depending on the time of year, and the tour lasts for about three hours and fifteen minutes. This solitary white tower is at a factory in Kitakyushu. Hato Bus run an alternative tour, called the Kawasaki Factory Night View Tour, which departs from Tokyo Station. It runs on Saturdays, plus some Fridays in summer, and it also promises to take you to Kawasaki’s best factory-viewing spots, including areas around the waterfront that are otherwise off-limits. The tour begins with a stop at Kawasaki’s Korea Town for yakiniku, and then spends two hours touring viewing spots around Kawasaki. The tours leave from Tokyo Station’s Marunouchi South Exit at 4:20pm. (Turn left after leaving the station to find the Hato Bus stops, and the Hato Bus office.) It arrives back at Tokyo Station at 9:30pm, and costs ¥5,980 including food. You can book on line by going to Hato Bus’s website, and entering the tour’s code, R294, into the search box. Alternatively you can book by phone on 03-3201-2725, at the Hato Bus office at Tokyo Station, or through many travel agents. 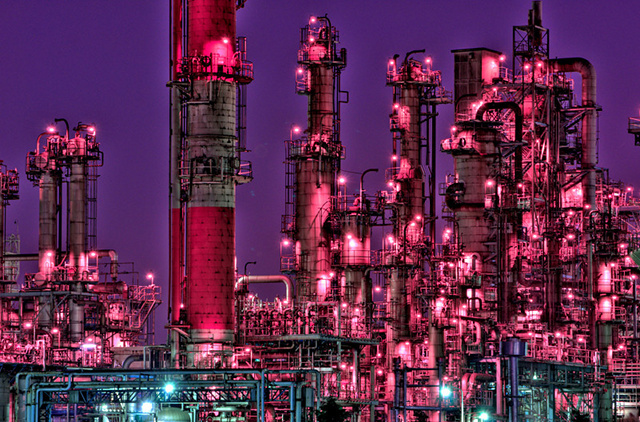 What goes on inside these steel towers is a mystery to me, but their purple glow makes them exotic and alluring. OK – so some people are allergic to organized tours. If that describes you, there’s no need to worry – you can explore the western parts of the Kawasaki and Yokohama industrial areas yourself using the Tsurumi train line. The Tsurumi Line begins at Tsurumi Station, and divides into three separate branches, all of which end at dead-end stations surrounded by factories. Tsurumi Station is half an hour from Tokyo Station on the Keihin-Tohoku Line (¥380). You can see the train line and the surrounding area on Google Maps here. Trains are much less frequent than on other Tokyo-area lines, and finish early at weekends, so you’d be well advised to check the train times before you go, and to go on a weekday. The weekday timetable for trains from Tsurumi (in Japanese) is here. Trains run back to Tsurumi from the Termini a few minutes after arriving. 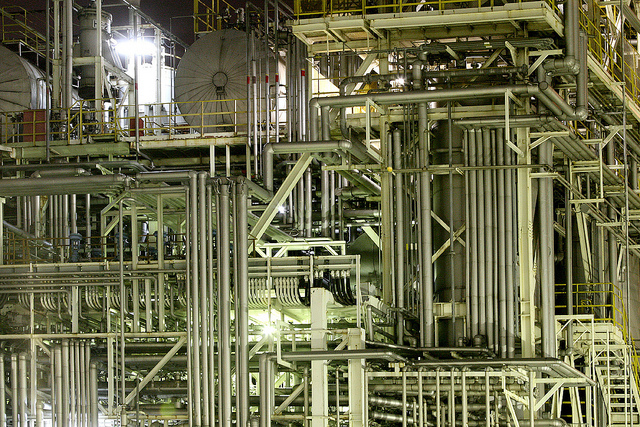 Someone seems to have gone pipe-mad when they built this plant in Kawasaki. The longest part of the Tsurumi Line from Tsurumi to Ogimachi is only 7km long, and the journey from end to end takes 17 minutes. It’s served by one or two trains an hour in the evenings, with the last train for Ogimachi leaving Tsurumi at 11:15pm, and returning at 11:35pm on both weekdays and weekends. The branch to Okawa is served by about one train an hour on weekday evenings, with the last outward train from Tsurumi at 8:10pm, returning from Okawa at 8:27pm. On weekends there are only three trains in the entire day! On the branch to Umi-Shibaura, there is about one train an hour in the evenings, the last train leaving Tsurumi at 10:10pm on weekdays or 8:30pm on weekends. The last trains back to Tsurumi are at 10:29pm on weekdays, or 8:55pm on weekends. While the trains aren’t very frequent, as the distances aren’t great, it’s not a big problem to walk between some of the stations, and there are local bus services that complement the trains. As well as passengers, the line also carries a lot of freight to and from factories in the area, but perhaps the line’s most interesting feature is the Umi-Shibaura Terminus. It’s located within the grounds of a Toshiba factory, so you’re not allowed outside of the station unless you’re a Toshiba employee. This unusual situation has made the station famous as ‘the station you can never leave’, and it’s become quite popular as a sightseeing destination. Toshiba have created a small park along the waterfront. It’s attached to the station, so you can get great views of the surrounding area from the park, before hopping back on a train to get out again. On the day of your tour, meet by the shinkansen entrance of Tokuyama Station, which is on the Sanyo Shinkansen Line. (From Shin-Osaka Station, it takes an hour and three-quarters by shinkansen, and costs ¥12,050.) Some of the places where you get off the bus are dark, so it’s recommended that you take a torch, and you should wear shoes that are suitable for climbing stairs. The writing on these tanks boldly declares that they contain gas. There’s also a boat cruise that lets you see Shunan’s industrial zone from Tokuyama Bay. The tours, called ‘Hunting Cruises’, run from Seahorse Marina in a boat that carries up to twelve people, and last for an hour and a half. The cost is ¥4,000, and the departure time varies by season. For bookings or enquiries call 0834-26-0444 or email si-ho-su@image.ocn.ne.jp. The marina is 7km from Tokuyama Station. A map on the tour’s web page shows its location. Not wanting to be left out, Shunan’s Hotel Sunroute Tokuyama has a Factory Night View Premium Lodging Plan, which claims to be the first of its kind in the whole of Japan. You get to stay in a room that has been carefully selected for its ‘gorgeous’ factory views. You even get a complimentary explanatory guide, and a special night view gift to take home with you. 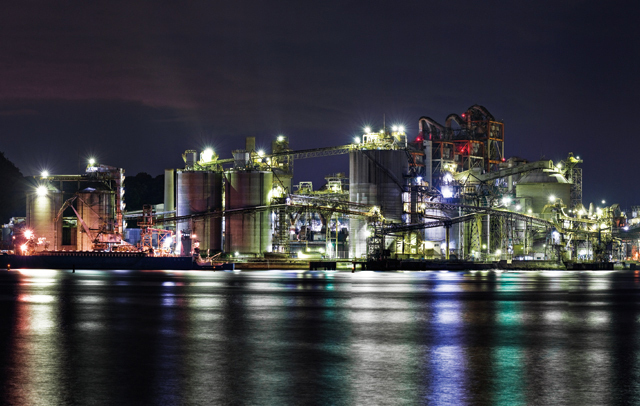 Himeji is famous for having the biggest and best preserved castle in all of Japan, but the city’s seafront is home to a large amount of heavy industry. Shinki Bus run a tour of this area about two or three times a month, and promise views of countless divine sparkling lights. First of all they take you on a one-hour boat trip to see the factories from the sea, and then a two-hour tour of the best factory viewpoints by bus. Tours depart from Himeji Station South Bus Terminal, usually at around 6:00pm, and return to the same point at roughly 10:30pm. (To get to the bus terminal, turn right after leaving the station’s south exit.) You can book online here, or by phone on 079-224-1919, or by email to web-snk@shinkibus.co.jp. When you book, or if making an enquiry, you should quote the tour code, BC-1201-7000AA. Himeji is 92km west of Osaka, and can be reached by shinkansen in 46 minutes from Shin-Osaka Station (¥3,640). 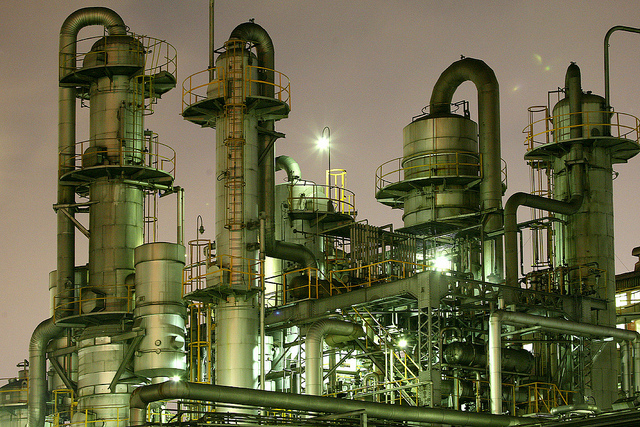 The towers and pipes of this chemical plant in Kawasaki’s Chidoricho district have a grace that was surely not intended by their designer. 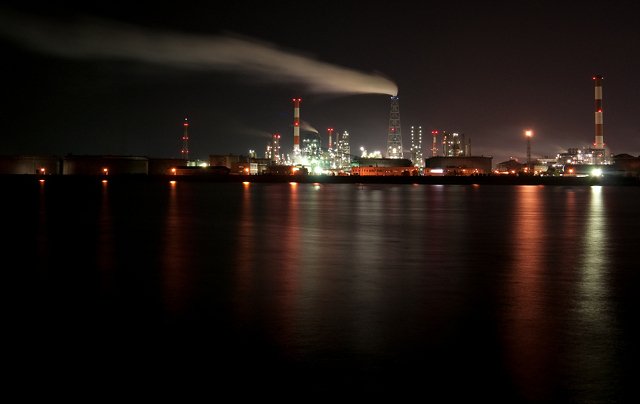 Muroran Night Cruising run boat tours of the industrial parts of Muroran City in Hokkaido. Cruises leave every day all year round, the time varying from 5:30pm in winter, to 7pm in summer. The entire tour takes place within the harbour, in a small boat that takes up to twelve passengers, but the views are superb. The tour costs ¥3,000, and advance booking is essential. You can book or make enquiries using the online form here, by email to info@muro-nc.com, or by phone on 090-1644-6793. Muroran Night Cruising is about five minutes drive (4km) from Muroran Station (a taxi is recommended). The access map showing their location is here. Muroran is about an hour and three-quarters from Sapporo, or two and a half hours from Hakodate by train. Either way you have to change at Higashi-Muroran for the short ride to Muroran Station, or take a taxi directly from Higashi-Muroran, which is 11km from the cruise’s departure point. Is it just me, or does this plant in Yokkaichi resemble a medieval castle? 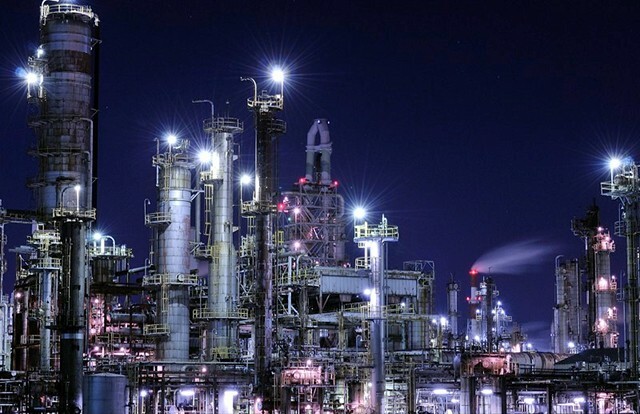 Since 2011, JTB have been running Factory Group Night View Appreciation Tours of Kitakyushu in Fukuoka Prefecture. 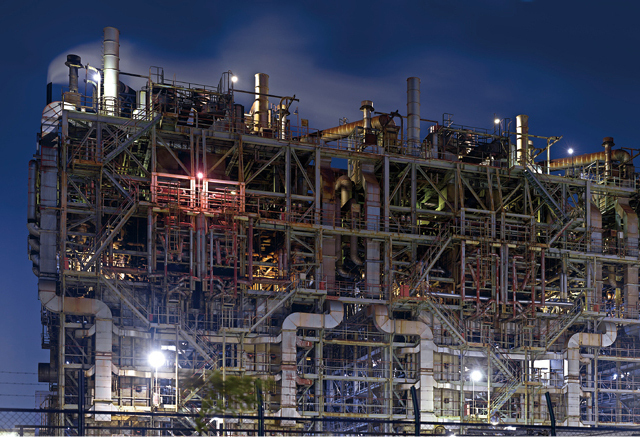 Kitakyushu is on the south-western island of Kyushu, but despite being more than a thousand kilometres from the capital, it is home to a huge industrial zone. The most recent version of the tour is described as a bus tour, but in fact includes four different forms of transport and a trip to a mountaintop beer garden. 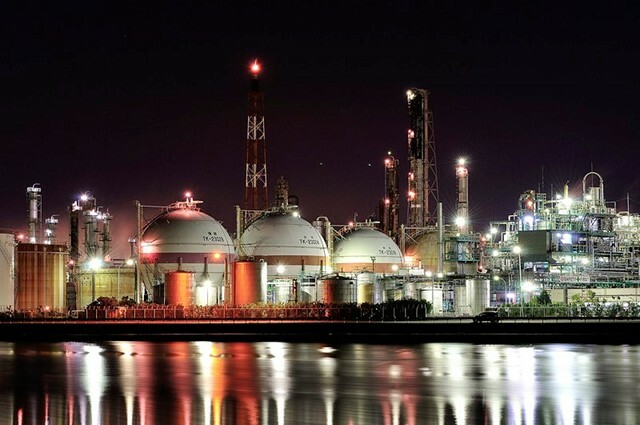 The tour begins at the North Exit of Kokura Station at 5:50pm, and you are then taken by bus to a ferry terminal to begin a one hour cruise of the Doukaiwan Inlet, a narrow body of water lined on both sides by a mass of chemical and iron works. On return to dry land, the bus then takes you to Sarakurayama Mountain, a 622m high forested green space that towers over the city. Here you change to the Hobashira funicular railway, which takes you almost to the top of the mountain. For the last part of the climb, you ride on a slope car, that in three minutes whisks you up to a beer garden. These tanks in Yokkaichi are almost like giant marbles, but lets hope they don’t roll away. From there, you can enjoy commanding views of the city below and the sea beyond. You can gaze down on far-off factories, residential areas, and even the Japanese mainland that lies on the other side of the narrow Kanmon Straits. Best of all, the tour price includes snacks and two free drinks. After an hour or so, you head down the mountain again, and the bus will take you back to Kokura Station where the tour ends. The whole trip takes around four hours, and costs ¥5,900. If that sounds a bit long, you can always just do the trip up the mountain yourself – the slope car from the summit runs until 9:50pm on Saturdays, Sundays and other peak periods, and the view from up there really is fantastic. Tours only run occasionally, so call JTB on 092-751-2102 for information about forthcoming tours, and to book. Kokura Station is 16 minutes (¥3,500) from Hakata Station in Fukuoka by shinkansen, or if you’re economizing, an hour and a quarter (¥1,250) on a semi-rapid train. 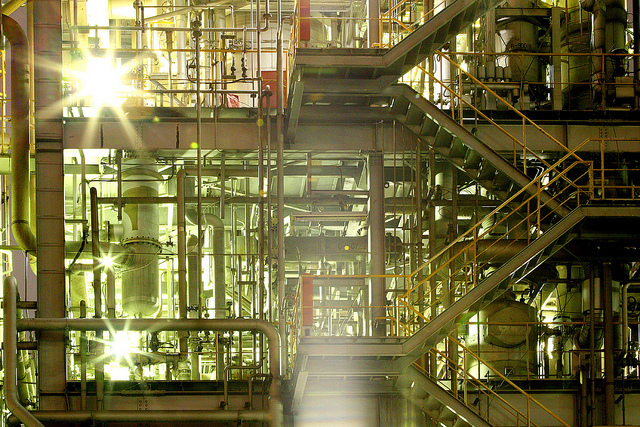 No it’s not a space rocket – just another chemical plant. 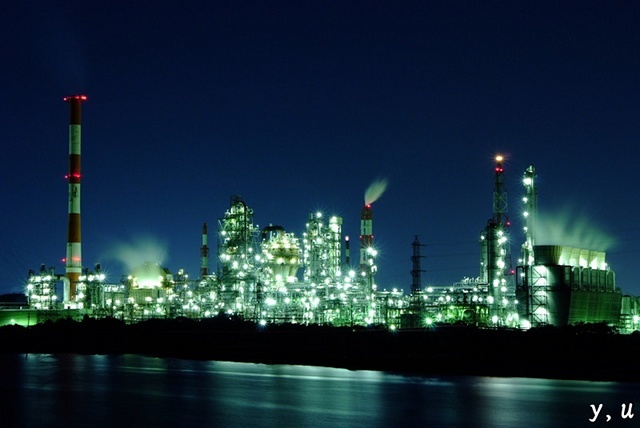 Nishitetsu Inn Kurosaki is promoting itself as an ideal place to enjoy a dazzling view of heavy industry in comfort. Their special plan guarantees you a room with a panoramic view of the Kurosaki Industrial Zone, which lies at the western end of the Doukaiwan Inlet. Your room will be somewhere between the ninth and twelfth floors, and will face the inland side of the factories. One night costs ¥6,000 for one person, or ¥8,000 for two people sharing a room. You can check availability and book online here. The hotel is just two minutes from Kurosaki Station, which is about 15 to 25 minutes from Kokura Station on the Kagoshima Line (¥270). It took some clever camera settings to create this dreamlike image. 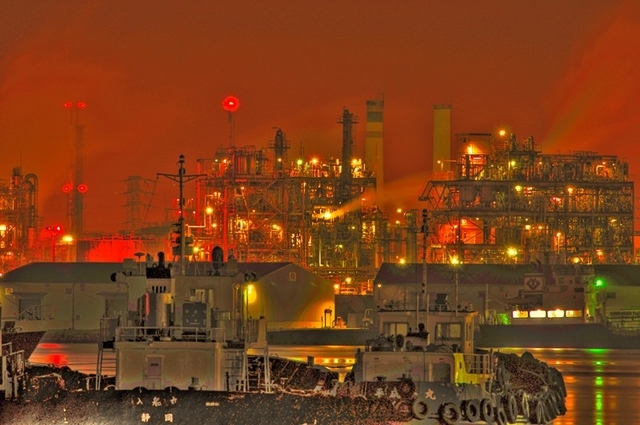 You can get some idea of the scale of Yokkaichi’s industrial zone from this photo, but it really only captures a small part of the whole complex. A one-hour cruise costs ¥3,500, and departs at 5pm in winter, or 7pm the rest of the year. In July and August, there is a second cruise at 8:15pm. You can either meet at the Yokkaichi Harbour Futo Building (marked with A on this map here) where free parking is available, or you can arrange to be picked up from either Kintetsu Yokkaichi Station or JR Yokkaichi Station. Phone enquiries can be made to the Yokkaichi Tourism Association on 059-357-0381, or by email to kanko@kanko-yokkaichi.com. Bookings are accepted by email, or by fax on 059-355-8311. To get to Yokkaichi, take the Kintetsu-Nagoya Line from Nagoya Station to Kintetsu-Yokkaichi Station (33 minutes, ¥610). Nagoya Station is on the Tokaido Shinkansen that connects Tokyo and Osaka. An alternative to the cruise is simply to visit the fourteenth-floor viewing gallery of Yokkaichi Port Building. 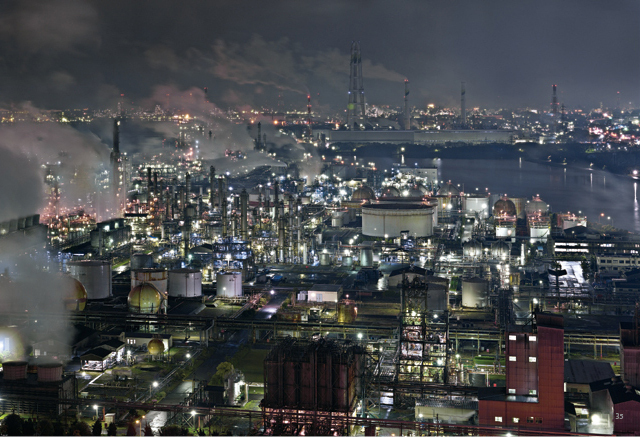 From there you get a panoramic view of the whole industrial complex. 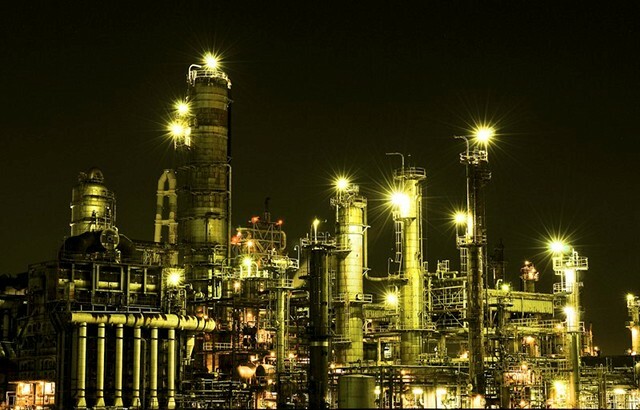 The building usually closes at 5pm, but on Saturdays year-round, and Fridays from July to November it’s open until 9pm, giving you ample time to take in the lights of the industrial complex below. Admission is ¥300. Do you think anyone really understands how so many bits fit together? 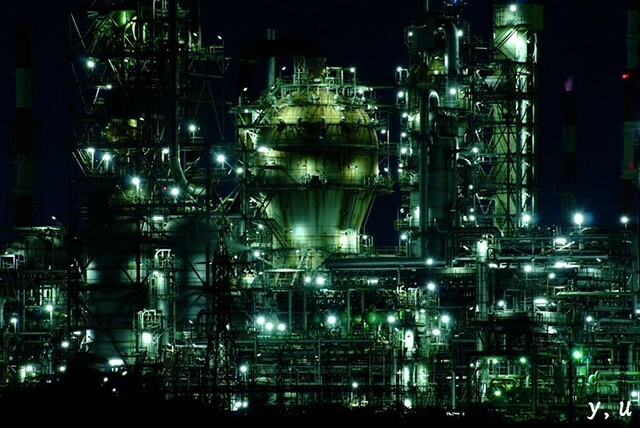 This factory in Chidoricho, Kawasaki, is a work of incredible intricacy. This magical view is of plants seen from across the Chidori Canal in Kawasaki. Wind, light and steam combine to create ghostly apparitions in the night sky. This almost looks like someone’s been having fun with a giant Lego set, but I’m sure all those pipes do something useful. 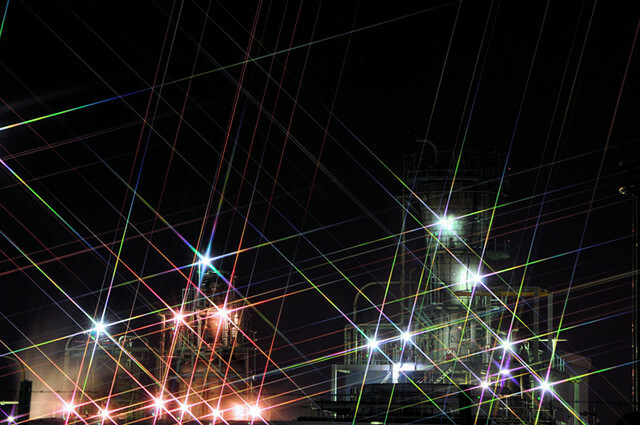 Lights can turn otherwise dull structures into gleaming ornaments. 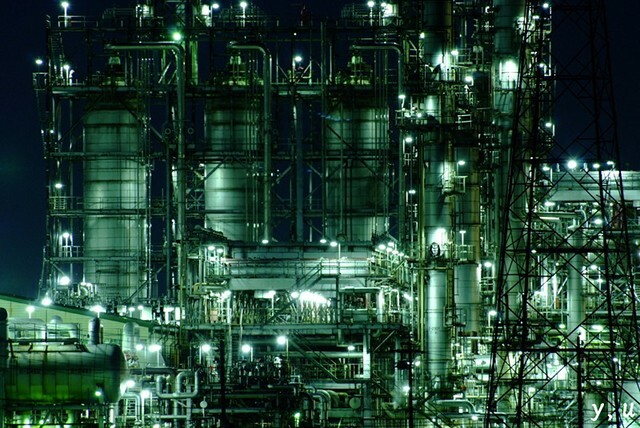 Does the darkness make this factory in Yokkaichi look sinister rather than beautiful? No doubt this plant was built without any concern for aesthetics, but its structures have their own unique beauty. 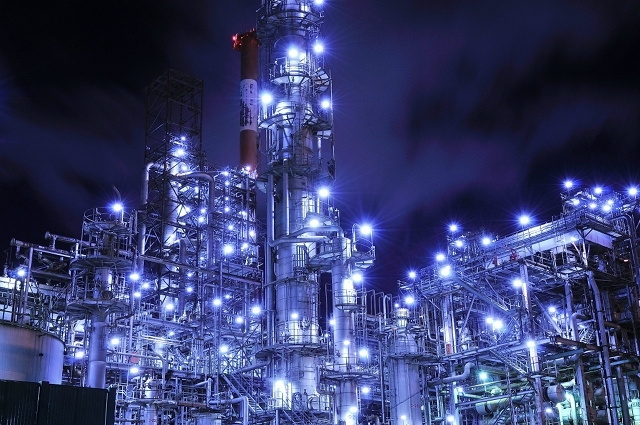 The lights at this petrochemical installation in Yokkaichi give away part of its structure, but leave us to guess about the details that remain in darkness. How long would it take to explore all these stairs, ladders and walkways? Every plant seems to be equipped with a profusion of such appendages, but you very rarely see anyone using them. 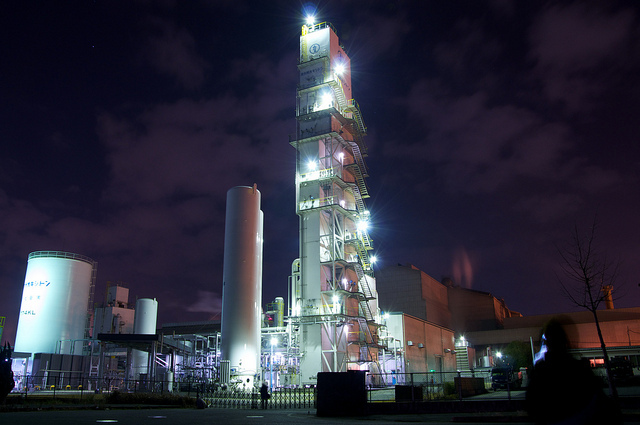 The twilight gives this plant in Kawasaki an eerie aura.